Shop for multivtamins for dogs at VetDepot.com. Dogs have complex nutritional needs. Vitamins and minerals assist with proper growth and development, skin and coat health, immune system and organ function, and thousands of fundamental biological processes. Nutritional deficiencies compromise a dog's health in a number of ways and can be devastating and fatal when untreated. Generally, dogs get all the vitamins and minerals they require from a standard diet of commercially available dog food. However, there is a variety of reasons a dog may need supplemental nutrients from a multivitamin. 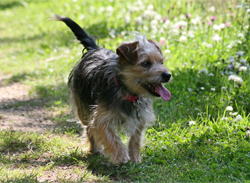 Quality commercial dog foods supply the vitamins and minerals dogs need. Homemade foods often lack some essential nutrients and may necessitate a dietary supplement. Dogs with disorders interfering with their absorption of nutrients benefit from supplemental intake. Others have skin, coat, or other health conditions that improve with increased vitamin and mineral consumption. Dogs that do not eat enough--perhaps due to old age, dietary restrictions, or digestive problems--also need supplemental nutrients. A pregnant or nursing dog has increased nutritional needs and may benefit from a multivitamin supplement, too. Although individual factors affect a dog’s daily nutritional needs, there are guidelines for minimum recommended vitamin intake. The fat-soluble vitamins are A, D, E, and K. Every day, dogs should get 50 IU vitamin A per pound of body weight or 2,225 IU per pound of food eaten, 5 IU vitamin D per pound of body weight or 225 IU per pound of food eaten, and 2 to 20 IU vitamin E; vitamin K is not an essential nutrient for dogs because they naturally synthesize adequate quantities. The B vitamins are essential water-soluble vitamins for dogs. Vitamin C is not essential because healthy dogs manufacture it in the liver. Per pound of body weight, dogs should get 0.01 mg of thiamin, 0.12 mg of niacin, 0.05 mg of riboflavin, 0.1 mg of pantothenic acid, 0.01 mg of pyridoxine, 0.002 mg of folic acid, 0.001 mg of biotin, and 0.00025 mg of vitamin B12 each day. 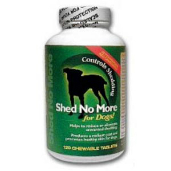 Never begin your dog on a multivitamin supplement without consulting your veterinarian. Excessive intake of some vitamins and minerals can be harmful. For example, too much vitamin A can damage blood vessels and cause other negative effects, too much vitamin D can cause muscular atrophy and other complications, and too much calcium can lead to skeletal problems. Your veterinarian can advise you on what nutrients, if any, your dog needs in supplemental form. Always follow your veterinarian's recommendations. Some nutritional deficiencies and other problems can be remedied by making dietary changes. 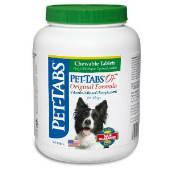 If your veterinarian advises use of a daily multivitamin supplement, ask whether a product such as Pet-Tabs is appropriate. Also, many dietary supplements provide scientifically formulated support for specific conditions or needs. Some meet the nutritional needs of elderly animals, others help with inflammatory conditions, while others, such as Shed No More, improve skin and coat health and aid with excessive shedding.